It's nearly time to say goodbye to Mitsuki and those in her year as graduation time rolls around... but not before a farewell party at her house! Although this whole event is supposed to be a surprise party, Mitsuki is already very much aware of what's going on, even if she perhaps wasn't expecting for herself and Sakai to be provided with an entire bucket filled with green tea pudding. As the festivities continue, Yuu disappearing into the kitchen where Haruka is already present and cooking sees Mitsuki's concerns as to what they might be up to flare up, and although (for once) the pair of them aren't kissing it somehow manages to end with a tug-of-war over Haruka between the two sisters (which Haruka seems to be enjoying far more than might be appropriate) before Mitsuki confesses her love for Haruka. This girl doesn't mess around, it seems. In fact, Mitsuki really doesn't hang around, as she's arranged to meet Haruka after her graduation ceremony to receive her response - a response that, surprisingly, confirms that Haruka loves Mitsuki. Although this sounds great, the trouble is that it soon becomes clear that Haruka really doesn't know or understand what love is (at least, not Mitsuki's definition of it), and once this dawns on them both it's obvious that the relationship Mitsuki is looking for with Haruka is one already enjoyed by Yuu. Then again, maybe Mitsuki has other admirers to consider, as one school year ends and another begins to round out the series. 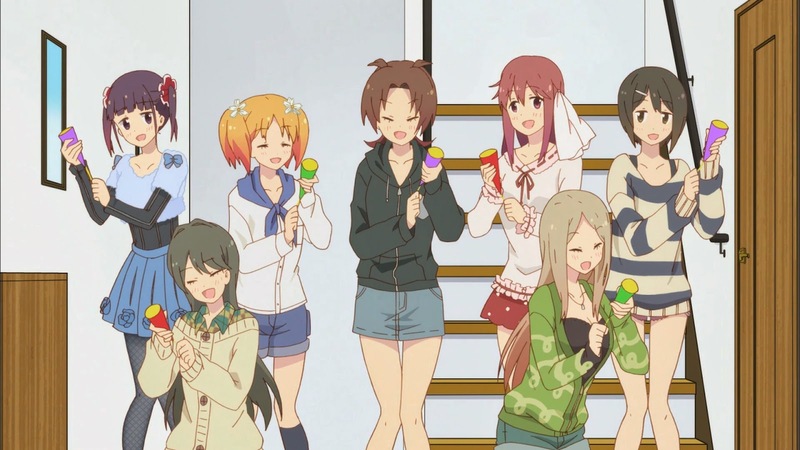 Although it sagged a little for a week or two in the middle, Sakura Trick has proved to be an entertaining weekly distraction throughout the winter season - funny often enough to be worthwhile and rather sweet at times, while bolstered sufficiently by its Hidamari Sketch-lite visuals to give it some aesthetic flavour... the azuki beans hidden within the show's proverbial bucket of green pudding, if you will. This may not go down as one of those much-loved slice of life comedies that lives on in viewer's hearts for years to come, but it's nonetheless a proficient series that moved its characters and their circumstances forward enough to make up for some of its elements which might otherwise have become repetitive. I'd like to say that lesbian proclivities have rarely been this much fun, but that probably isn't true - that isn't a statement that should detract from the fact that Sakura Trick has been an enjoyable viewing experience though.